The world's window onto Shimizu S-Pulse: Into Our 6th Season We Go! It took several friendly suggestions (and several more friendly reminders) on Big Soccer from other English language J. league writers to give it a go. But it was only after a 1-0 home win back in April 2008 that we, with some reluctance, finally took to the blogosphere. After three cup finals, several t-shirts, three books, articles on various football sites, and having been lucky enough to get acquainted with the top brass at S-Pulse, I'm genuinely able to say it was a life changing decision. 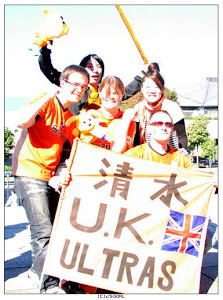 The blog has given form to the UKU as a home stadium does a football team. Twitter may have taken over from message boards, and is where a lot of our news can now be first found, but as we head into our sixth season (our 9th as S-Pulse supporters), this page is going nowhere. The visitors we get (yes, that means YOU!) make sure of that. With you beautiful people in mind, we'll endeavour to make this year our best yet. It's a pleasure every time someone introduces themselves as a reader, and I love seeing from where the visitors to the site come from. Our last ten are from corners of the globe as wonderfully diverse as Canada, Germany, the US and Croatia. Welcome to the site and thank you for reading - we're all brothers in S-Pulse! Looking back over old postings, some make me cringe, some give me goosebumps. Most of all I can't help recalling that old Fat Boy Slim song. We've come a long, long way together. Through the hard times and the good. I have to celebrate you S-Pulse. I have to praise you like I should. The J. League is still so new, S-Pulse are still so young. We've got it all in front of us. Bring it on. 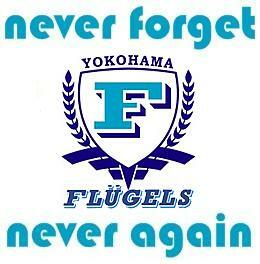 Yay, it's only the beginning, it'll really start when S-Pulse will be the champions ! Our French community is on its 8th season, and the evolution of the J.League has been very interesting to follow during those years (the main change being that finding games in streaming is much easier he he). Also, websites from other countries get in touch with us to ask questions about the players that come to play in Europe, and more and more Japanese players come in Europe (honestly I don't really like that as I only watch the J.League, but hey). It's still quite hard to promote Japanese soccer in France, we're often the target of jokes such as "bla bla they don't know what football is, don't they ?" or "bla bla you're just a bunch of otakus, why don't you support your own country..?" etc. But fortunately, the performances of the National Team really help us to gain visibility (0-1 against France, how about that ?). 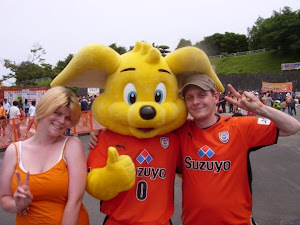 I followed Shimizu since 2005 (I'm the only S-Pulse supporter among the core of our community, but they know they can't tell bad things about my team), the same year the website was created, and I never was worried about relegation. Well, except in 2005. But it means the team is meant to fight at the top, not at the bottom, and I'm sure this year will prove it once again. Thanks for posting the reports and the videos of those games I still can't attend to (snif...), and I can't wait for the season to start !